A surprising line-up by Thomas Tuchel, as he opted to bench some of his regular starters. Sven Bender played as the 6 and the extra centre back as well. When dropping deep, he filled the space between Sokratis Papastathopoulos and Mats Hummels. Bender often tried to utilise long vertical passes, to the dropping-deep Pierre Emerick Aubameyang. Eric Durm filled the left back position, benching Marcel Schmelzer. Henrikh Mkhitaryan on the opposite flank tried to create attack from wide areas. In midfield, in front of Bender, Tuchel paired the natural defender, Matthias Ginter who occasionally dropped deep to the 6 with Moritz Leitner. Roger Schmidt, as usual, fielded his 4-4-2. Admir Mehmedi started on the right wing and Karim Bellarabi shifted to the left. One of the potential reasons for such a setup was that Schmidt wanted Bellarabi to attack diagonally and hit Dortmund with his right foot. Mehmedi was a bit different, with his indenting-movement, which enabled him to fill the 8 both on half-space and central area to make sure the shape was secured in central areas. At 6, Kevin Kampl and Christoph Kramer were paired once again, and played a very important part within Schmidt’s system. Basically, Dortmund shaped up in a 4-1-4-1. But this would be transpositioned into a 3-men-behind as Bender dropped deep in the first phase of attack. This created a 3v2 situation against Leverkusen’s first-line press helping them to bypass it and allow for easier progression. This numerical superiority meant Bender could move into the 8 or make a vertical pass directly to Aubameyang, the false 9 in Tuchel’s positional play. With Kramer and Kampl oriented to Leitner and Ginter, Dortmund (Bender in this context) gained some space centrally which helped to make a direct passing lane from the back-line to Aubameyang. Again, in this phase, when Aubameyang saw the opportunity, he dropped deep and created another numerical superiority along with Leitner and Ginter against the 6-pair of Leverkusen (3v2 for Dortmund). As the numerical superiority provided positive impact to Dortmund’s first line of attack, Leverkusen needed to deal with such movement. Kramer was often the one to respond it and put pressure on Bender. This often meant that Kampl was outnumbered by three Dortmund players. But this didn’t mean the Dortmund shape was a flawless one. In some specific situations, particularly when Leverkusen were able to establish the horizontal compactness (through the assistance of both indented-wingers) and executed it properly, it meant they defended the central area better, there would be a gap between the three-chain and midfield-line of Dortmund. Such a gap had negative impact to the connectivity of play which meant they lost the central access. Leverkusen were very compact centrally, as ever. Tuchel asked for a more direct approach from his players. In such play, we can see Mkhitaryan (or Aubameyang if possible) as the main target of the long ball from the deeper players. Here, Dortmund relied on how Mkhitaryan could create play through his explosive movement. Such direct play also effected how the full backs played. This was partly the reason why we didn’t see very aggressive play of Eric Durm or Lukas Piszczek. The long ball directly to the furthest forward players meant the full backs were automatically relatively late to move forward. Against the ball, the ball-oriented shifting was a standard one, as the far-side winger had to make sure he covered the far half-space or the centre. In their defensive-play, Dortmund opted to play a relatively middle-block as they start the press from the central-line. Aubameyang would determine the pressing manner as he was the first-wave of press and the most aggressive one as well. Here, Dortmund mostly shaped in a 4-5-1/4-4-1-1 and waiting for Leverkusen to come out. This allowed Leverkusen to have relatively high procentage of possession in their deep-development. The pressing-shape was adjusted as, one example, Leitner went forward to track the dropping-deep 6 of Leverkusen or even higher as he took Bernd Leno. Leverkusen, as shown on the first graphic, pressed high-up the pitch trying to force Dortmund to play a lot of long balls in uncomfortable situations. Some defensive issue can be seen in their high-block press. When Dortmund built up with a situational three at the back formation, Leverkusen needed to equal the numbers to halt the progression. This was an issue when the lines behind the forward-duo were a little bit late to move out to cover spaces in the more advanced areas. For example, when Bender and Sokratis managed to drag the attention of the 9-duo, to the right side, and the ball was switched to the left, back to Hummels, this situation forced Mehmedi to come up and press Hummels. Mehmedi’s movement allowed huge space behind him which allowed Durm to receive any distribution form Hummels. Tin Jedvaj was tasked with covering Mehmedi’s vacated space. Mehmedi pressing-manner also provided some space for either Leitner or Ginter to stay on the ball-side half-space and get close to Durm to maintain the nearest passing-lane, keeping the connectivity alive. Hole within Leverkusen’s high-block press. Mehmedi pressed Hummels (not seen in the picture). Tin Jedvaj had to make a long run to deal with Durm who received Hummels’ pass. When Leverkusen managed to regain possession deep in their own half, for example, they would circulate the ball across the back-line trying to find good access for progression..
As Schmidt wanted Chicharito or Stefan Kiessling to get involved in this phase, he needed to make sure the passing lane was clear. It was the 6-pair, Kramer and Kampl, who took this duty. They occasionally moved wide to the half-space or even to the flank to open the central area. This made the 6 space available so any 9 was able to drop-deep to help created a vertical access. In some other situation, Kramer stayed centrally whilst Kampl occupied the near-ball flank. such swinging-6 positioning managed to drag the opponent focus to one side and opened the space on the far ball side flank, in the middle-third, that being occupied by Chicarito and made himself available as the outlet from Dortmund first-phase press, as well as pushed Leverkusen’s full back to get further forward. This scheme had its own issue. In the context of clean progression, Leitner was the issue for Leverkusen. As aforementioned, Leitner played as the 8 so he was the one to keep an eye on Kramer when the midfielder dropped-deep to help creating central access for Leverkusen deep-circulation. In this situation, the central space was blocked so Leverkusen had to take the long ball option. But it was not always a wasted one. When the structure was executed properly it would be a success zugriff planned, a German term which can also be translated as a plan to create an access by a purposely missplaced-pass then recover by claiming the second ball, or regain it by gegenpressing. This scheme was established by the extremely-narrow-shape of the midfielder-four. The gegenpressing in this scene gave some positive impact to Leverkusen transition, particularly as it managed to fail Dortmund’s counter-attack. Right after the break, Tuchel got Marco Reus in to replace Pulisic. The other (major) adjustment was the basic formation. In the second-half, Tuchel decided to play with an asymmetrical basic shape of 3-5-2/3-4-1-2. With three dedicated central defenders + double pivot in front of it, Dortmund possession game in the deeper area was strong as the central-control was well-occupied. On their second phase of attack, Tuchel still utilized Aubameyang as the connector between the deep-circulation and more advanced area penetration. Reus as we can see always tried to exploit the half-space. Schmidt took Kampl out and replaced him with Ramalho as the new 6. He was assigned a simpler duty compared to Kramer. From Dortmund, Julien Weigl was brought in to replace Bender. But all of these substitutions didn’t bring any significant impact, as both sides were struggling to deal with each opponent’s defensive barrier. Despite the struggle from both sides, individually, there were some interesting note to be taken. Wendell played an inverted wing back-esque role which resulted in some positive impact on the attack and stabilized the center. A good signal as the wing back is developing into a more complete player. Moritz Leitner also played exceptionally; some of his positioning (off the ball movement) in attack actually gave potential situation for Dortmund and might have given better result if utilized properly. So did Christoph Kramer: a world-class midfielder. His pressing resistance helped him to find space for a better passing-lane. His defensive positioning enabled him to support the need of gegenpressing and kept the shape stayed compact. Good defensive play from both sides. Dortmund won it by the single goal from Aubameyang but Leverkusen deserved a draw. Borussia Dortmund lined up with a 4-3-3 formation, whilst Stuttgart opted for a basic 4-4-1-1 shape. Thomas Tuchel’s team utilised plenty of attacking fluidity, with Henrikh Mkhitaryan, Marcos Reus & Pierre-Emerick Aubameyang often swapping positions. Shinji Kagawa & Gonzalo Castro were also particularly vertically-oriented from central midfield. A gradual and structured movement was observed in Dortmund’s deep build-up phases, with an approximate 2-3-2-3 shape. Sven Bender and Sokratis Papastathopoulos were the deepest players, with Ilkay Gundogan acting as the 6. These three were flanked by Lukas Piszczek and Marcel Schmelzer. In Dortmund’s first phase of play, Kagawa and Castro alternately dropped deep and filled the half-space right next to Gundogan position, depending on the ball position, to help creating a soft and clean progression through numerical superiority. The movement of Kagawa and Castro in this phase was important as it allowed them to form twin or sometimes three 6 across the Stuttgart first wave of resting-press. With this, Dortmund were able to avoid Gundogan being crowded out by the Stuttgart players, and ensure a passing lane was always open. The positional play. On certain occasions, Castro and Kagawa were even positioned higher than the forward trio. In later build-up phases, Aubameyang occasionally dropped deep and acted as the vertical access of Dortmund progression. Swapped with Reus and Mkhitaryan, he then moved wide to the flank to allow Castro to occupy the right halfspace. Along with Reus and Kagawa, Castro acted as the 9/10 hybrid, getting ready to move vertically into the 18-yard box when the opportunity arose. With Mkhitaryan occupying the left flank, Dortmund attacked in a 2-3-5 alike shape. As ever, the central orientation of Thomas Tuchel’s Dortmund attack is strong. There would be 3 or 4 Dortmund’s players to occupy the area between the lines within Stuttgart’s structural block. Free swapping of positions from Mkhitaryan, Reus, and Aubameyang combined with the constant, vertical movement of the 8s for effective penetration of the Stuttgart defensive block. After about 10-15 minutes, Aubameyang started most of his movement from the wide area, particularly from the right side. This gave him huge space to run into and reach his blistering top speed, such as for the second goal. As shown on the last graphic, there were three Dortmund’s players within the Stuttgart’s structural block. When Sven Bender pushed forward (in a Hummels-esque manner) Gundogan stayed central, covering the movement. Two other players in the center, Kagawa & Reus, dragged the attention of Gentner and Baumgartl, isolated them, and created the space for Castro (and Aubameyang) to move into. 2-0 to Dortmund. As usual, a quick progression with decisive passes from the deeper area to the more advanced areas to launch a fast penetrative was also a key ingredient of the Dortmund attack. The first goal was a good example of this. It took only 12 seconds from Roman Burki’s initial pass to Reus’ low cross into the box. This first goal alone was also the perfect example as to why Tuchel pushed his CMs further forward. This allowed them to make late runs into the box, and finish off attacking moves, as Castro did on this occasion. Lining-up in 4-4-1-1/4-4-2 often saw Stuttgart to defend in two banks of four + two as their initial pressing-shape. This shape would be transformed into a 4-5-1 if Dortmund progressed deep into the Dortmund half. Dortmund’s central focus meant Stuttgart’s structural block responded by shaping more narrowly themselves. This helped Dortmund to create huge space, both on the flank and in the halfspace. Stuttgart’s wing-backs manner on attack indicated the initial approach of Jurgen Kramny, their new Head Coach. Instead of trying to stretch from wide areas, they tended to sit deep and waited for Dortmund to come close. In their counter-attack scheme, it appeared to be a common approach from Kramny to leave Timo Werner forward in case of any potential opportunities for a quick transition. It was not a coincidence that two Stuttgart main threat on attack were Daniel Didavi and Timo Werner. They provided the mobility and pace needed in attack. Their job is not merely to score goals, but Didavi also showed how mobile he was as he shifted from one side to the other side to create attack or help stabilize the defensive phase. Didavi slotted the single goal as Lukas Rupp saw a vulnerable space left open caused by Sokratis, as the Greek made a positioning error and opened the right side. Rupp pass the ball to Filip Kostic was later continued by an assist from Kostic to Didavi. After the break, Dortmund adjusted. Aubameyang positioned himself more centrally than he did in the first-half. Mkhitaryan and Reus started from wider positions, flanking Aubameyang in the central area. Dortmund maintained their compact defense as they created a lot of valuable overloads over and over. Stuttgart defensive transition, especially after losing possession in attacking set-piece, was weak. In the second-half this continued to deteriorate. Just 15 minutes into the second-half, there were 3-4 dangerous situations that illustrated the pace at which Dortmund can attack, after regaining the possession from Stuttgart’s throw in and set-piece situations. 15 minutes into the second half, Tuchel brought in Julien Weigl to replace Kagawa. Weigl took the central position at 6 which was mostly occupied by Gundogan. Sometimes Weigl moved slightly wider to the half-space formed a double-pivot along with Gundogan. Here, in their build-up, Dortmund shaped in a 4-2-1-3/2-4-1-3, with Castro acting as a 10, with a focus on drifting between the Stuttgart midfield and defense. This structure found its maximum effect in the 64th minute. Weigl moved forward through the left half-space, in the middle-third. Reus, marked by Schwaab, was on the higher left half-space, in the final-third, and Castro was engaged with Rupp. With Schmelzer unmarked on the left touchline, Dortmund gained a quick numerical superiority, a 3v2 situation. A pass from Weigl to Schmelzer was forwarded by the left back to Reus, a low cross from Reus forced an own goal by Neidermeier. There was also issue within Stuttgart’s resting press; the space between the first line and the second line was huge. This was often triggered by overzealous pressing from their first pressing wave on Dortmund’s ball carrying central defender. This didn’t merely weaken the vertical coverage but also gave space for Dortmund’s pivot to receive the ball. The second issue was the spatial compactness ruined by bad positioning. Sometimes Stuttgart’s wide players positioned too wide and too close to Dortmund’s wide-man. This opened the channel and access for any Dortmund’s vertical play. Thomas Tuchel played his boys with an aggressive approach of positional play. The vertical 8s and continuous interchanging between the forward trio made it extremely difficult for Stuttgart to defend. Aubameyang added to his amazing scoring record. Aside from his goal-scoring contributions, but he also continued to carry out his duty as a false 9; a vital component of Dortmund’s build-up. He often dropped deep to the 10 and 8, moved wider, and also made late runs into the box. Another good win for Dortmund, especially after their two consecutive losses to Hamburg and Krasnodar. This win establishes their position with 7 points clear of the Bundesliga’s third place. A serious title challenge may prove difficult, but it seems that Champions League football will return to Borussia Dortmund sooner rather than later. Roger Schmidt opted for a pair of poachers, Stefan Kießling & Javier Hernández, as his striker duo. In the middle line, as a response to fitness issues for Lars Bender, Schmidt started Kevin Kampl to accompany Christoph Kramer shielding the back line. For Dortmund, in the absence of Marco Reus, Thomas Tuchel opted to play Jonas Hofmann. Matthias Ginter started as the right back meaning Lukas Piszczek stayed on on the bench. Immediately after/when Dortmund started to play out of back, Leverkusen shaped with their “normal” pressing set-play, which consisted of four pressing sequences. The first wave was generated by Kießling who pressed the ball carrying center defender (CD), sometimes depending on the ball position and game development, Hernández occasionally took the task of pressuring the ball carrying CD. When the first 9 put the pressure on the Dortmund’s CD, the other one had to make sure (1) he nullified the working space for Dortmund’s six who dropped deep in this 1st phase of build-up and (2) be ready for the second sequence when the other CD got involved in the build up. If Dortmund’s CD insisted to play through the middle, to any central midfielder, Leverkusen’s six would come up and close him down. By taking notice on Kevin Kampl’s pressing orientation it was clear that his initial duty in this pressing-scheme was keeping close to Ilkay Gundogan. 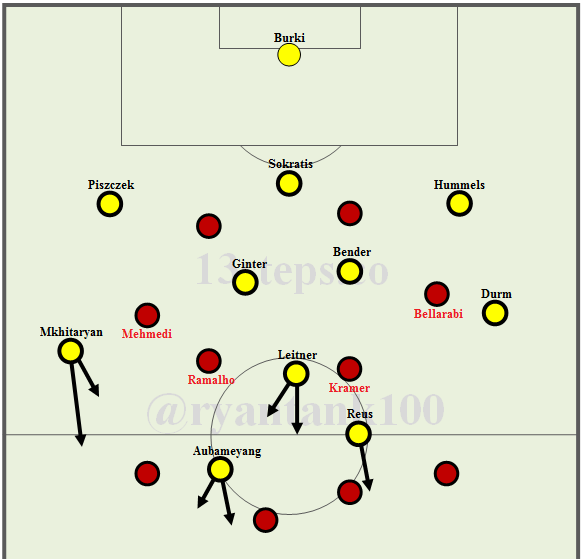 By occupying centrally both Leverkusen’s wide-men blocked the diagonal option to the wing plus the middle press assisted by the twin 6, it was never easy Dortmund to try to overload the area across their six to overcome such pressing. All of these wide-men and six pressing manner of leverkusen can be considered as the 3rd and 4th sequence. Dortmund reacted well as they had their own plan of dealing with this: Pierre-Emerick Aubameyang was the outlet. He moved to the 8, in his role in this positional play, to provide the 3rd passing lane as well as receiving the pass from the ball carrying CD. His movement often gave his team the opportunity to transition quickly into offense. By using Aubameyang as the outlet, there were two main advantages gained by Dortmund. The first, Jonathan Tah had to follow him which meant the Leverkusen’s CD left his post in the back line. And second, it allowed Henrikh Mkhitaryan and Jonas Hofmann to stay on the upper half-space or flank both to maintain the possibility of tight ball-circulation or stretch the opponent’s defense. By dropping deep, Aubameyang was able to create 3rd passing lane and a triangle shape which enabled Dortmund to launch a quick counter attack. When Aubameyang was not able to drop-deep in his effort of creating the “3rd line scheme”, caused by his too-high-up-pitch position for example, it was Shinji Kagawa who presented himself on the left half-space at 8. The way he was able to receive the pass from Hummels was based on two major factors. First, the asymmetrical diamond-positioning of Hummels, Weigl, Schmelzer & Kagawa, which loosened Leverkusen 2nd line compactness. The second biggest support was the bad performance of Christoph Kramer. 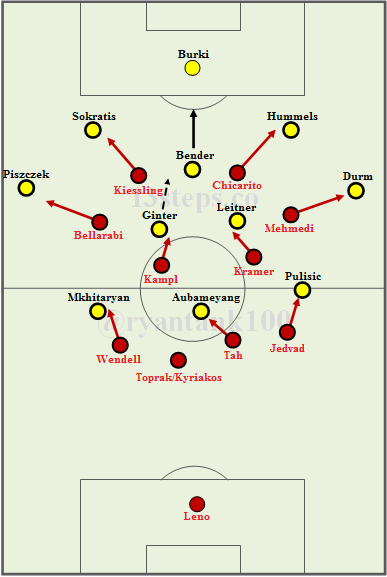 It was he and Kampl tasked with securing any through or direct pass to the central midfield, but in many occasions Kramer made individual mistakes which allowed Dortmund to keep the possession and progress more easily. In short, followed by a quick attacking transition, Dortmund often seemed to benefit from this positional play. As mentioned in the paragraph above, the issue of Leverkusen’s press was the individual mistake which contributed to a lack of stability within the press. This was evident at 32:12 (one example of many). A good pressing shape had created a 4v2 situation in favor of Leverkusen. They managed to isolate Kagawa from others, as Leverkusen clearly got better ball access. Kagawa mis-controlled the pass from Mkhitaryan which should’ve allowed Kießling to regain possession, but this did not happen. The 9 missed the opportunity and allowed Kagawa to regain the loose ball. When Leverkusen played this pressing-scheme properly, they managed to force Dortmund to play long ball which Leverkusen would be happier to deal with. In some occasions, Dortmund seemed to find the way through this pressing-scheme by playing to the wide. But here was issue for Tuchel to pay more attention on. It was Dortmund’s right hand-side looked to be more susceptible, possibly as the consequence of Dortmund left side focus which in turn made their left side overloading to be more stable. Matthias Ginter was found in occasions to misplace his pass when he was used as the ball progression point in Dortmund’s 1st to 2nd phase of deep build-up. One such examples occurred in the 40th minute. Roman Burki played it long to the right touchline into the middle third. Ginter (the target) played a one touch header to Gundogan in a difficult position. Leverkusen’s twin CMs, wide man, and 9 could immediately overload Gundogan, regain possession, and quickly shifted the ball into the centre of the pitch. It gave good access for Leverkusen to generate the gegenpressing, retaking control of the ball, and attacking the opened space in the center. Overall, Ginter missed six (more than Schmelzer did) of his ‘1st phase build-up’ passes. All this six-pass we’re talking here was received directly from the back line and was almost immediately pressed. The pressing intensity and Dortmund bad overloading around the right hand side seemed to cause a difficult situation for Ginter. Thomas Tuchel is the one to identify the root cause. He needs to reduce such potential weakening variable, as he also makes sure that Ginter is “pressing-resistant enough” to keep his place within his juego de posicion. When they got the pressing to work successfully, Leverkusen would make a quick counter attack (if possible) as they seemed to want to exploit the opponent’s transition phase. Their key weapons in such counter attack were their indented winger (in 4-4-2 box shape) and intelligent inverting movement by the full back. The indented winger made sure to avoid Leverkusen from being underloaded in the central area. The wingers were also used as the transition point (wall-pass) of the diagonal play. The winger would move from a central area to the flank to play short-quick combination with the attacking full back. When the full back (Wendell for example) needed to transitition centrally, this winger would be the one to occupy the half-space, enable the wall pass, and open the space for the full back to move diagonally to the 18 yard box. The situation from 27th minute was the perfect example of this. Leverkusen, for sure, would prefer to build patiently from their own third instead of rushing into a questionable long ball. But Dortmund never allowed Leverkusen to play this well. Every time Dortmund got the chance to press the goalkeeper, they would be more than happy to do it. Aubameyang was the first layer in this scheme and Dortmund benefited from such play as it created issue within Leverkusen early build-up phases. One to note, such pressing needs some adjustment within the formation to avoid numerical inferiority. By pressing the opponent’s goal keeper Tuchel knew they would lose one outfield player that was needed for overloading and second-ball battles as well. This was why Dortmund always tried to overload the area of where the ball fell onto by narrowing their back line shape, to allow any of their CD to move out to the intermediate-defense area to duel with Kießling (as the prime long ball target). This intermediate-play was supported by the backward movement of the central midfielders (CM) or the indenting wide-men. With this, Dortmund managed to nullify any potential play that might be generated from Kießling’s aerial ability (something Lazio failed to prevent from in their Champions League play-off clash). With Kießling to be considered as the main threat (and prime Leverkusen long ball target) it was crucial to eliminate all his direct involvement in any aerial duel. Based on the aerial duel map from squawka.com, Kießling won 4 of 11 aerial duels. When we take a closer look at all of these 11 scenes, we’ll figure out that Leverkusen would struggle at ball-recovery. Dortmund made 5 straight away recoveries at the first touch of the second ball claim. 2 recoveries were made 5 seconds or less after the duel was done. And 1 other recovery was made 7 seconds after the aerial duel. While Leverkusen recovered 3 of them. One can say Dortmund’s central midfield spatial compactness had contributed hugely to the ball-recovery action. 6 of the 8 recoveries were recorded by the 3 CMs with 2 others (of 8) made by Roman Burki and Marcel Schmelzer. The positional structure in a narrow shape had been a very big contributor in this matter. Dortmund’s pressing was based on their 4-5-1/4-1-4-1. In general, the variant they used was an option-oriented one which occasionally looked like it was space-oriented, particularly when their own far-side half-space/flank was not occupied by the opponent’s players. In this very specific situation, Dortmund’s 4-5-1 tried to occupy 3 horizontal spaces (near flank/half-space, and center). But the story was different since the opponent occupied the far half-space/flank, as shown on the graphic below. 56:35 – a Dortmund’s 4-5-1 zonal pressing. As the left side was not occupied, Mkhitaryan looked to squeeze the right side space. Different defensive-manner would be taken along with the forward movement by Giulio Donati. Mkhitaryan would have moved closer to the half-space or even to the far-flank to deal with any attack from Donati. The identical defensive action had also been shown by Marcel Schmelzer; he man-marked Hernández on the farthest side. As the 3 CMs tried to block any pass through the center, some space was allowed between the middle and back line. To reduce the potential exploitation to this space, Hummels was the one to deal with any threat occurred around the intermediate-defense. Hummels (and the other Dortmund defenders) ability of defending the intermediate area was an integral part of Dortmund’s tight defense. This was extremely important as the intermediate(-defense) is a strategically crucial area of breaking the opponent’s defensive block. A pass to this intermediate area could potentially ruin the compactness as it always invites or lures the back line to move out and press. This has been the natural occurrence of the intermediate area reaction to any pass which is played onto its territory. If it happens in an intermediate-middle area (the area in front of the middle-line) of middle-third (for example), you can argue it takes some distance to reach the defending team’s goal. A pass to the intermediate middle (especially to the center or half-space) and its potential response (press from RCM or RAM) of the defending team’s midfielders, eases the potential penetration either by the LM or LCF. Any forward press by the RCM will open the space in the more centrally area. A press from the RAM might open the space on the flank. Often during their 2nd line press, Dortmund 3 CMs pressed collectively to the same space in order to block any opposition progression. In turn, this created some space in the intermediate-defense. Here the capability of defending the intermediate-defense is crucial. The level of direct threat towards the goal of such pass is raising as if the pass is played to the intermediate-defense, particularly in a deep area (zone 5 or penalty box). As you can see in the graphic below. A pass to the intermediate-defense and the potential response from the opposition back-line. A scene from the Dortmund vs Monchengladbach match. Lars Stindl managed to find the way through the center and the ball went straightly to Rafael. The striker made a one touch pass to his left which was intercepted by Mats Hummels. Such play has two polar opposite sides. On one side, with great anticipation, decision and composure of the CD, the defense will stay stable, as they could move out at the proper timing to stop any threat. On the other hand, the potential exploitation of such huge space remains there, particularly by a needle-players whose on-ball technique and quick decision are the true strengths of them. Hummels moved out to defend the intermediate area. In this scene the situation was relatively quiet as no diagonal forward passing was provided. Dortmund’s defense and its relation to attacking transition was also supported well by their flexible basic shape of 4-2-3-1 and 4-1-4-1/4-5-1. The 3 CMs, Kagawa, Gundogan, and Weigl quick transition and their staggering to each other was the key. Combined with the narrow shape, Dortmund gained a lot of advantages as they reach good level of horizontal and vertical compactness. 55:16 – an extreme horizontal and vertical compactness in a narrow shape, half-space overloading, and its advantage on the transition. A high-up press forced Kyriakos to play it long. As discussed earlier, Dortmund were very capable of dealing with it. The pass was intercepted by Sokratis. In his positioning of keeping the shape remained vertically-compact, Weigl was able to recover it and play it forward to Gundogan. These 3 CMs staggered in a triangle shape often found to be effective in regards to their need of tight and save ball circulation. This is evident in the above graphic. A one touch passing play between Weigl, Gundogan, and Kagawa had provided nice diagonal passing combination and provided a good attacking space for Dortmund. Aubameyang noticed the opportunity and he shifted fast to the far half-space to receive Kagawa’s diagonal through ball. Despite this situation ending up without a goal, one thing is clear; the extreme narrow defense, good level of vertical compactness, staggering positioning among the CMs which generated diagonality had achieved its purpose. Another brilliant scene was the sequence of play within the 55’s minute. Started by a Sokratis forward pass to the right hand-side, Dortmund began their attack. A compact press of Leverkusen halted the progression. Dortmund needed a square or backwards pass. A good movement by Weigl to the upper-right half-space provided a back-diagonal passing lane for Mkhitaryan. It then allowed the ball to be shifted from the ball-side half-space to the far half-space of where Kagawa and Hummels alternately occupied on. This suddenly opened a strategic progression as Hummels played it forward to Mkhitaryan, who also occupied the half-space in the final-third. From his position, Mkhitaryan gained a diagonal passing chance. He straightly played it diagonally to Aubameyang who in a very good view to the goal as the 9 had its face towards the goal. Mkhitaryan diagonal pass from half-space to Aubameyang in the center. Good for Leverkusen as Mkhitaryan missed it and the ball was claimed by Bernd Leno. For additional information, below is the graphic of passing comparison. The graphic is taken from the 5-serial analysis on half-space (in Indonesian) from September 2015, at fandom.id. If you want to read another recommended analysis on half-space you can go to Rene Maric’s. Another perfect example? The second goal. It was Mats Hummels with his 26 meter visionary diagonal pass to Aubameyang in the central circle of the upper middle-third. Leverkusen regained possession but in no more than 5 seconds Hofmann’s gegenpressing regained it. Ginter recovered it and made a forward pass to Hofmann. With a quick turn-around, Hofmann briliantly took on Kyriakos on the right byline. A cut back from the right winger was made to Gundogan, who occupied the near-ball half-space. Gundogan made a simple pass, from half-space to the center, to Mkhitaryan. The Armenian couldn’t miss it anymore, as his diagonal pass rightly reached Kagawa who slotted the second goal. Diagonality, positional structure, and gegenpressing played their part to the max. 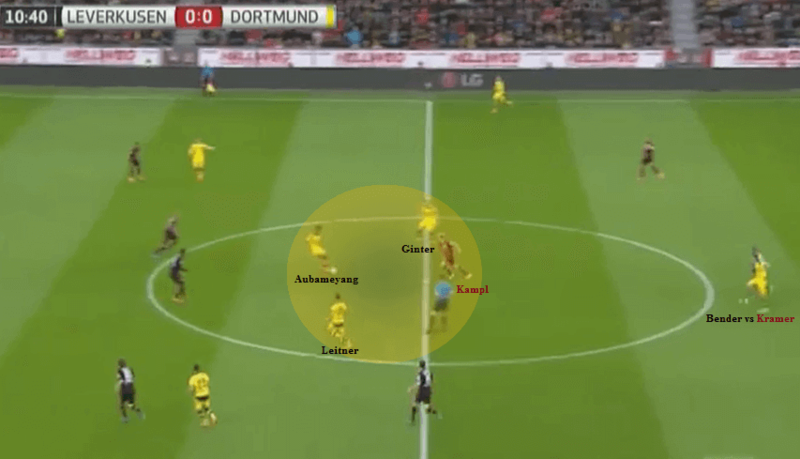 Half-space and triangle shape had been a lot discussed in various tactical pieces as the key of Dortmund’s switch play. Achieving the right-timing of the combination of near-ball half-space and near-ball flank occupation created the triangle allowing to switch. Dortmund applied this very well. The other nice and interesting set-play in Dortmund’s switch-play is their occasional far-flank overloading, as shown in this match. There were several moments to see that Leverkusen were not prepared well for such a situation. But we take these two moments as the example. 1. the 9th minute. Before Mkhitaryan switched diagonally from ball-side half-space to the far half-space, Jonas Hofmann filled the far half-space. Then he moved to the center when the diagonal ball was released to reach Matthias Ginter who moved gradually from deeper to final third flank. Leverkusen’s left side defense had been broken by the right-timing movement by Hofmann and the late-arriving Ginter. 2. In the 22nd minute, Dortmund moved and overloaded even more intelligently, as both Ginter and Hofmann overloaded the far flank and created 2v1 situation. 32:17 – switch play from half-space and far-flank overloading. Life was never easy for Wendell. This in turn led to a cross by Ginter to the center. The white arrows with straight line indicate the man-orientation on Leverkusen zonal marking. Special case applies to Wendell. The far-flank overloading had given him an additional task which split his focus, either to stay with Ginter or to follow Hofmann. The behaviour of Calhanoglu was a sign that his movement was not a planned one, which would also suggest Leverkusen were not well prepared for this situation. Horizontal and vertical compactness, intermediate-defense play, and half-space occupation had given Dortmund a secure defense as well as a flexible & quick transition between their defensive and offensive play. This meant the stable gegenpressing was ready to be generated whenever Dortmund needed to. If there is a striker to be considered as an underrated one, it is Aubameyang. Last season, a piece by Colin Trainor of statsbomb.com on Dortmund’s flop shows us despite Dortmund’s flop, it could be suggested that Aubameyang still performed decently as he maintained the level of his statistic performance. Many people recognize Aubameyang as a speed-merchant. The one with light-speed run who is versatile enough to play both on as a wide forward and central striker. This season, under Tuchel’s guidance, Aubameyang seems to be becoming better than ever. In his role as a false 9, his involvement in preventing his team from being isolated (particularly in Dortmund’s 1st phase of build-up) was fascinating. His contribution to build-up is fantastic. Aubameyang’s heat map against Leverkusen (by whoscored.com). Moving across the middle and final third. In the above graphic, Dortmund’s back line (particularly Hummels as the ball carrier) was isolated and might be forced to play it back to Burki, Dortmund’s goalkeeper. But his composure allowed him to be patient and calm to observe any potential open space. Aubameyang understood this and dropped off to the 8 zone to create a potential passing lane. The false 9 accommodated the play away from pressure and isolation whilst quickly followed by a promising offensive action against the lacks stability of the press as he lured the press and managed to play the ball to Kagawa. The initial movement by Aubameyang had in turn ended up with this (promising) attacking scene. Dortmund’s second goal was also a nice example of how crucial Aubameyang’s role was, both in preventing the deep build up from being isolated as well as the check-point of Dortmund’s ball progression. Again, by dropping off to the 8 zone, Aubameyang provided a “new” passing lane for Hummels. This movement was not directly connected to the Dortmund’s 2nd goal, as Leverkusen briefly regained possession for 5 seconds before Dortmund managed to retake it and scored. But it was clear, without Aubameyang intelligent movement, Dortmund might not be able to easily progress the ball, which means Kagawa may never have scored the second goal. Aubameyang mobility throughout the match had been a huge positive factor contributing to Dortmund’s progression. He dropped deep, got himself involved in a duel, made recoveries, moved from flank to flank, opened the space either by a pass from various strategical areas or his off the ball movement. Along with Shinji Kagawa, Aubameyang deserves the man of the match award. Anything else to say but ‘brilliant’ for Tuchel’s team? Dortmund played their football to the maximum level. They stopped Leverkusen from playing out of the back, they squeezed the central area, and their chances creation in the penalty box is simply top level. For a brief look you can see an xG graphic created by Michael Caley. Separated by next two matches, FC Bayern will play Dortmund at Allianz in the match day 8th of Bundesliga. A potentially to be the match of the season. A classic clash of the highest level of German clubs competition. For deeper understanding of Dortmund’s Tuchel, you should check out spielverlagerung’s works. You can find a lot of worth reading Dortmund-related pieces there. And, for sure, Pep’s Confidential or any juego de posicion articles (with Adin Osmanbasic’s as a highly-recommended one). Cheers.